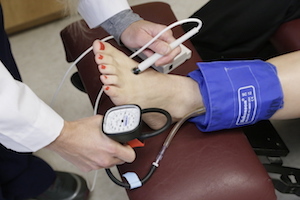 LHHP is proud to offer Ankle-Brachial Index testing to screen for arterial disease as part of the Executive Wellness Examination provided to our members. Long endorsed by the American Heart Association and the American Diabetes Association, this noninvasive test is done by measuring blood pressure and Doppler signals at the ankle and in the arm while a person is at rest, lying comfortably on a table. The test takes about 15 minutes. There is no sedation or medication adjustments required for this test. There are no needles, dyes, or radiation used. An abnormal ABI can be the first sign of developing heart disease or cerebrovascular disease. In published research, the presence of a low ABI was predictive of a 3- to 4-fold increase in the risk for total and cardiovascular mortality in a cohort of 1537 elderly men and women followed in the Systolic Hypertension in the Elderly Program (SHEP). Further, McKenna et al. documented a 5-year mortality of approximately 30% and 50% in patients with an ABI of 0.70 and 0.40, respectively. Early identification lower extremity PAD allows your healthcare team and you to act earlier to reduce the increased risk of MI, stroke, and premature death. 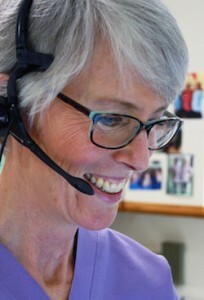 Office Hours: Tuesday – Friday, 8:00 a.m. – 5:00 p.m.